Laurel Snyder, probably best known for her middle-grade novels Up and Down the Scratchy Mountains, or, The Search for a Suitable Princess, Any Which Wall, and Penny Dreadful, presents a Judaism-themed board book that’s preschooler-perfect. Nosh, Schlep, Schluff: BabYiddish records a day in the life of one young tot (could be either gender; one of the outfits makes me think girl, but maybe he’s just wearing an oversized shirt). 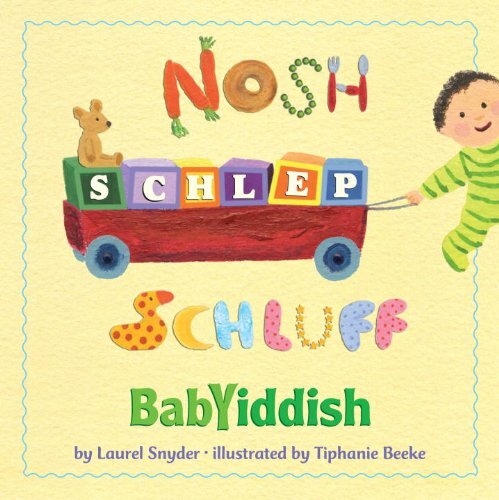 There’s lots of humor in the kid-friendly text, which includes at least one Yiddish word per page, printed in all-caps for easy identification. My favorite line: “If you want to start a ruckus, / wave your arms and shake your TUCHES!” Tiphanie Beeke’s accompanying pastel-hued illustrations show a tousle-haired, rosy-cheeked protagonist toting around a stuffed froggy. (Why a frog? So Snyder could rhyme ribbits with KIBITZ.) A glossary might have been helpful, but almost all of the unfamiliar vocabulary is figure-out-able in context.